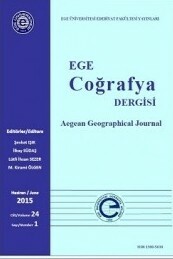 Aegean Geographical Journal has been published by the Geography Department at Ege University in Izmir since 1983, is an international refereed journal published two times a year. The Journal aims at contributing and disseminating contemporary scientific geographical knowledge. Scientific articles, both empirical and review, are published, primarily in the areas of physical geography and human geography. Aegean Geographical Journal is open the diverse articles on the sub-branches of geography such as economic geography, cultural geography, rural and urban geographies, tourism geography, population geography, spatial analysis and modelling, climatology, remote sensing, GIS, geomorphology, hydrography, paleogeography and as well as on geographical education and other spatial disciplines.